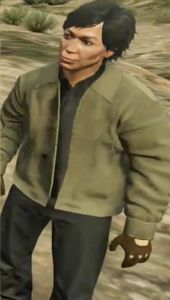 Taliana Martinez is a character in the HD Universe who appears as a minor character in Grand Theft Auto V. She is voiced by Carolina Ravassa. Taliana Martinez is, in 2013, a getaway driver for a small crew operating in Blaine County. The crew had robbed a pawn shop, which was to earn them $20,000 each. The police, however, were using the building as a sting to capture the thieves. Two of the crew were captured while Taliana and an unnamed accomplice escaped. After evading the police and getting through three road blocks, Taliana loses control of the car after her accomplice held her at knife point at about 100mph. An injured Taliana is then driven to Sandy Shores, to get unregistered health care, by one of the GTA V protagonists. After this encounter, she becomes available for various heist missions as a getaway driver taking a 5% cut of the crews take. Taliana can be chosen for The Bureau Raid's "Loud" approach. If chosen, she will turn up with an Ambulance, which will confuse the crew until they realise. She allows Franklin or Michael to drive during the getaway. The Ambulance does not attract police attention although if an inexperienced gunman (Karl Abolaji, Daryl Johns, Norm Richards or Hugh Welsh) are chosen they may fire a gun out the back of the Ambulance, which can draw attention. Taliana can be chosen for The Big Score. If the player chooses the "Loud" approach and Taliana as driver number one, she will pilot a Frogger with half the gold without problem and if chosen as driver number two she will drive the train without problem. However if the player is unsuccessful with keeping the helicopter steady enough for Lester to shoot down pursuing helicopters, Taliana will crash into one of the windmills, killing herself and losing half of the gold. Taliana's cut for heists is 5%. Despite her low take, she is a more competent initial choice than Karim Denz, but is not as proficient as Eddie Toh. She states that she reduced her fee as a favor for saving her life. If the player does not reach Sandy Shores quickly enough, Taliana dies from her injuries. This page was last modified on 28 December 2014, at 16:20.